The Viking Sea is a modern vessel that sails to some amazing destinations. Enjoy comfortable life on board. Experience the ultimate all-inclusive cruise vacation on board the Viking Sea. With a capacity of just 900 guests, the Viking Sea provides all the amenities of a state-of-the-art vessel with the intimacy of a small ship experience. Choose from a variety of Interior, Oceanview and Balcony staterooms and luxury Suites, featuring stylish Scandinavian design and ultra-modern facilities. Stunning international cuisine, fine dining and alfresco eats awaits you on board, as does a lively range of bars and lounges to entertain you when the sun goes down. Enjoy pampering Scandinavian spa experiences at the luxurious LivNordic spa, which features the innovative Snow Grotto, and a fully equipped fitness center. Cruise the Mediterranean, Caribbean, Mexico and Canada on board the Viking Sea. Experience the ultimate all-inclusive cruise vacation onboard the Viking Sea. With a capacity of just 900 guests, the Viking Sea provides all the amenities of a state-of-the-art vessel with the intimacy of a small ship experience. Choose from a variety of Interior, Oceanview and Balcony staterooms and luxury Suites, featuring stylish Scandinavian design and ultra-modern facilities. Stunning international cuisine, fine dining, and alfresco eats await you on board, as does a lively range of bars and lounges to entertain you when the sun goes down. Enjoy pampering Scandinavian spa experiences at the luxurious LivNordic spa, which features the innovative Snow Grotto, and a fully equipped fitness center. Cruise the Mediterranean, Caribbean, Mexico, and Canada on board the Viking Sea. Expect the epitome of Scandinavian elegance on board the Viking Sea. 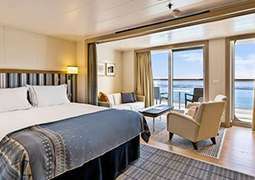 There is a wide variety of stylish, state-of-the-art staterooms from which to choose, from the Veranda, Deluxe Veranda, and Penthouse Veranda staterooms to the luxurious Explorer Suites. You will discover a world of culinary delights on board the Viking Sea, with a variety of restaurants and cuisines on offer. Take a seat at the Chef’s Table for internationally-themed food nights, sample authentic Italian fare at the Italian Grill, or if you’re feeling peckish poolside, snack on delicious morsels at the Pool Grill. Viking Sea boasts an incredible entertainment and evening program. The main theatre hosts special lectures, movies, and ted-talk broadcasts daytime, with spectacular stage shows taking over come sundown. If you fancy a more relaxed evening, catch a flick at on the big screen in the Winter Garden or head to the Explorer’s Lounge, which hosts pianist performances in an exquisite, sophisticated setting. A highlight on board the Viking Sea is the incredible LivNordic Spa. Experience total relaxation and rejuvenation in the Thermal Suite, indulge in an unbelievable spa treatment or massage or visit the innovative onboard Snow Grotto. There is also a fully-equipped fitness center on board and a jogging track, which circumnavigates the ship, providing unforgettable views while you stay active. With Viking’s trademark elegance and interiors, Viking Sea is the very best vessel serving the Caribbean sea today. The Sea is a very special ship with an intimate feel on board. Here it will be neither boring to you, nor will you be astonished at the power of the cruise ship. The Scandinavian-style ship will enchant you in no time. The Viking Sea let you choose from a variety of entertainment and activity options, and locations from which you can enjoy sailing through the most remarkable destinations. The Viking Sea offers a wide range of dining options offering a varied selection of cuisines. All the dining options are exciting and unique, carefully prepared by the professional chef and hospitality staff. The charming Manfredi’s Italian Restaurant is one of the great dining rooms on the Viking Sea, which offers world-class menu with meals from the Mediterranean region. The Viking Sea features more full-size staterooms and full-size verandas than any other Viking’s ship. Choose Explorer Suite, Deluxe Veranda or Penthouse Veranda stateroom to suit your travel style. State-of-the-art design mixed with comfortable furnishing make for the perfect environment to take in the beauty, sights and places of the Caribbean. Have you already been enchanted by the Viking Sea? Then book with us on the Dreamlines website. Our professional cruise experts will gladly help you. The Dreamlines team wishes you a fantastic cruise with the Viking Sea!